의학신문 모바일 사이트, Meeting my unborn baby with VR? Meeting my unborn baby with VR? [의학신문·일간보사=정윤식 기자] GILJAESOFT(CEO Lee Sang-lim) provides pregnant women with a new software to watch a fetus with VR through 3D image. 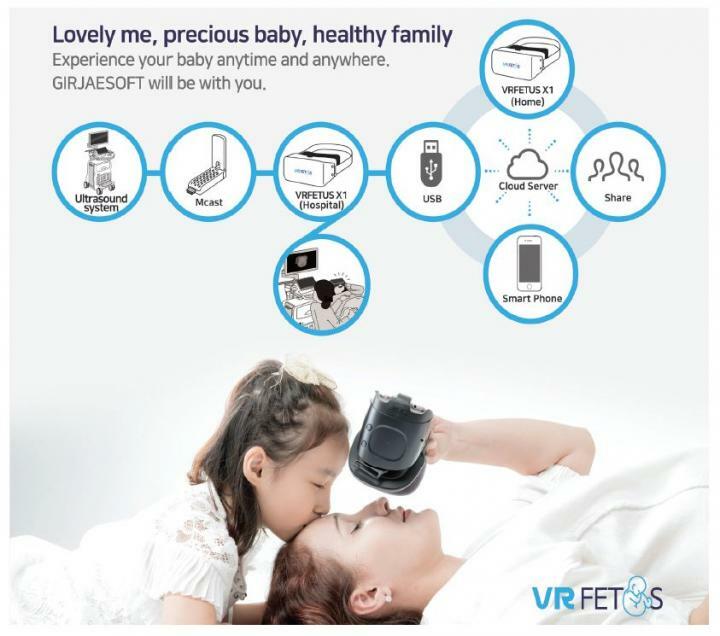 Based on 20 years of experience in ultrasound medical device development at GE Healthcare, SIEMENS Healthineers, and Alpion Medical System, CEO Lee Sang-lim of GILJAESOFT has completed developing “VR Fetus,” and is ready to launch the proct at home and abroad. VR Fetus, developed by GILJAESOFT enables users to watch a fetus via VR instead of monitor. When mothers have ultrasound screening examination at hospitals, mothers and fathers can wear the VR device and look at the fetus more lively, and they can turn their heads around to see the fetus from various angles. “VR Fetus”consists of wireless image transmitter and a dedicated VR device (or HMD). The wireless image transmitter sends 3D ultrasound image real-time without having to be connected, while the dedicated VR device separates and displays the received 3D ultrasound image real-time to both eyes of the user. For installation, connect the wireless image transmitter to the video output unit of the ultrasound devise, and connect the dedicated VR device to the wireless image transmitter via wi-fi. There is no need to install a separate software on the ultrasound device. As the world’s first-ever product that has converged medical ultrasound image with VR, "VR Fetus,” has been selected as “BEST OF KIMES TOP 10” when it was unveiled at the Korea International Medical and Hospital Equipment Show in March 2016. It was also showcased in the Korea VR Festival in September 2017, where Prime Minister Lee Nak-yeon tried out the product. With the cooperation with a Korean ultrasound manufacturer, "VR Fetus” was upgraded with the function of controlling the 3D ultrasound image of the device in August 2018. In January 2019, the product was displayed at the CES held in Las Vegas, the U.S., unveiling the technology of 3D fetus model that reflect the fetus’ face and growth for the first time internationally, and garnered much attention. Moreover, GILJAE SOFT has also launched“Aluvw,”an application for pregnant mothers, through which users can look at the growth of the fetus in 3D. The video received from the hospital after ultrasound screening can be played on the application. As for the fetus’face screened via 3D ultrasound, the user can tilt the smartphone to look at the image in various angles, as well as look it using VR. In addition, portions of the fetus video can be shared with spouse and family members via cloud server. “Aluvw”application also provides the fetus growth trend in a graph based on the growth parameter, and in certain weeks, the image is also displayed in 3D model.